Cold spray-applied thermoplastic featuring hot-applied thermoplastic performance. 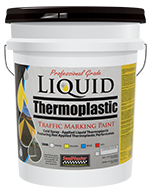 Liquid Thermoplastic Traffic Marking Paint can be applied with standard airless spray equipment. 5 Gallon Pail 72 lbs. 55 Gallon Drum 800 lbs.